Thank you to Mary, Katie, and Moose for staffing ARRoc’s table at the Alternative Fair on Saturday (I was there Friday). 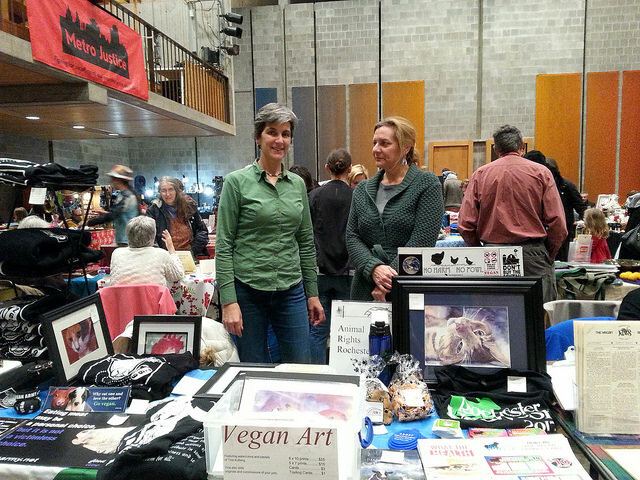 We talked to lots of people (like the person on the right, above) about veganism and Rochester VegFest’s programs, and raised some funds too. Thank you so much to Katie for donating many beautiful pieces of jewelry, Bubbie and Deb and Mary for making dog treats, and to Mary for letting us sell Vegan Army and Gopala merchandise at cost. Thanks also to Mary for bringing all sorts of materials such as the Roc Vegan Guide restaurant cards (check them out! ).